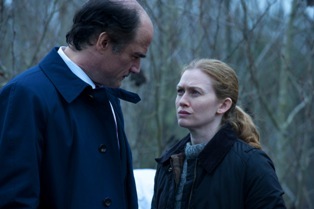 Will Linden (Mireille Enos) and Holder (Joel Kinnaman) get a chance to save someone on this season of AMC’s The Killing? While last season was focused on the murder of Rosie Larsen, this season has the two detectives searching for the missing Kallie Leeds (Kate Sproule). Yes, there has been a killing, and yes, Holder and Linden want to figure out who did it. But Kallie may still be alive, and Holder has made it his mission to find her. 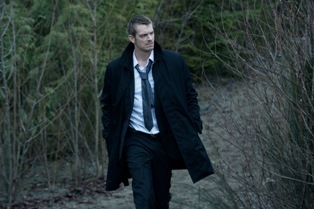 Linden, who has been reinstated to the Seattle Police Department, once again became obsessed with the case she had worked prior to the events of the first two seasons of The Killing. The third episode of the season, “Seventeen,” deepens the mystery of how the current events are related to the past. 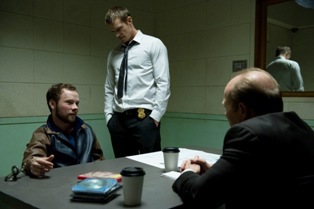 Linden’s obsession revolves around the idea that the convicted killer, Ray Seward (Peter Sarsgaard), is not guilty of the crime he is about to be hanged for. One of the things I find most interesting about this season is that Seward is about as unlikable of a character as it gets. We don’t really want him to be innocent. He is a scary guy – every time someone steps near him, I’m afraid of what he will do to them. Nonetheless, if he is innocent of the crime he has been convicted of, he shouldn’t die for it. It’s an interesting dynamic. In no way do we feel sympathy for this character, making it hard to root for Linden to figure out what really happened. It’s a great morality play. The reason Linden thinks Seward is innocent is one of the things that ties that past case to the present. The murder of Seward’s wife was carried out in the exact same way as the murder victim of this season. It also matches a slew of bodies Linden discovered in a remote pond. The bodies are all young prostitutes. They were all killed three to five years ago (according to the medical examiner), and now the killer seems to be going after teenage prostitutes again. Kallie Leeds may be the killer’s most recent victim. Since it seems the other victims had been kept for several days before being killed, Holder and Linden have a chance to save her. To be honest, I’m not sure if that is what this season is going for or not. For all I know they will find Kallie, dead or alive, in the next episode or two. I like that things are up in the air right now. Kallie’s mother Danette (Amy Seimetz) is a character I think will play a much bigger role as the season goes on. Right now she’s just kind of been in the background. As a mom, you couldn’t ask for much worse. She doesn’t care about Kallie at all. She even told Kallie she ruined her life just by being born. So will Danette take an interest at some point when she finally realizes Kallie is in real trouble? I’m thinking she will. By far the most interesting character so for is the condemned Seward. As I mentioned earlier, he is not a good guy at all. He is manipulative, mean, and extremely violent. He also seems capable of just about anything, as evidenced by his self-injury in this episode – and by self-injury I mean he took a razor blade to his own flesh (presumably so he could end up in the infirmary?). He may or may not have a soft spot for his son. That remains to be seen. I really don’t know what’s in store for this character, but the tension rises whenever he is on screen, which adds another level to the show. So far I think season three of The Killing has gotten off to a good start. I’m looking forward to seeing where they go with all the interconnecting storylines. I’m loving this season so far!